Momentum continues to build around the Triathlon Mixed Relay format, ahead of its debut at the Tokyo 2020 Olympics. In Australia, world champions and Commonwealth Games representatives Ashleigh Gentle, Charlotte McShane and Matt Hauser will headline a new Triathlon Mixed Relay Invitational at Runaway Bay on the weekend of 17-18 March. Runaway Bay is a suburb on the Gold Coast in Queensland, Australia. The invitational event is an initiative by Triathlon Australia to give Australian athletes an opportunity to compete in a Mixed Relay only competition. 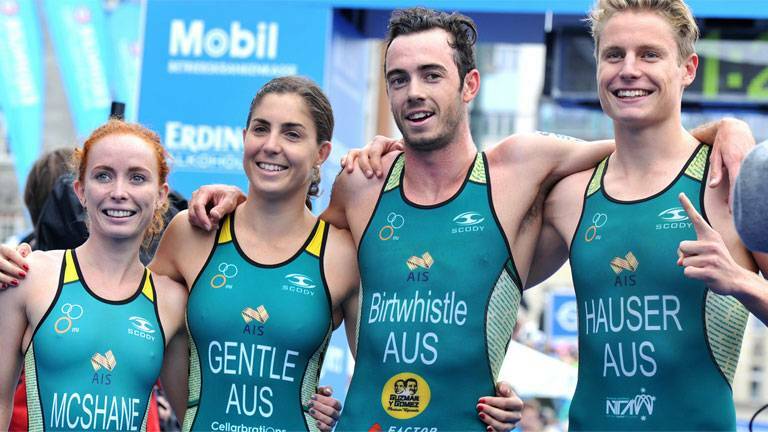 Gentle, McShane, Hauser and Jake Birtwhistle produced a stirring victory to win Australia’s first Triathlon Mixed Relay World Championship in Hamburg last year. Mixed Relay will also be contested in next month’s Gold Coast Commonwealth Games after debuting in Glasgow in 2014 where Australia finished with the bronze medal behind England and South Africa. Sixteen teams, 10 from Australia and six international teams, including USA, Canada, Hong Kong and Wales have been invited to participate in the inaugural event. Triathlon Australia’s High Performance Director Justin Drew has been the driving force behind the initiative, which provides an added opportunity for an extra medal event at a major Games. The 2018 Gold Coast Commonwealth Games will feature the men’s and women’s elite events; the men’s and women’s Paratriathlon Wheelchair events and the Triathlon Mixed Relay – with Australia fielding an overall triathlon team of 12 – the largest ever Games contingent. Drew said the concept of a Triathlon Mixed Relay Invitational would give Australian elite athletes a chance to hone their relay skills against each other and to provide up-and-coming development athletes the chance to race against some of the world’s best triathletes, including members of the reigning World Championship team. “This will provide the athletes with an ideal opportunity to race in what is one of the most exciting events added to the triathlon events calendar,” said Justin Drew. “Our athletes will get the chance to compete in a high level race situation and hone their skills, which will help develop them for future World Championships, Commonwealth and Olympic Games,” Drew continued, who also praised the support of the Gold Coast City Council. The two-day event at the Runaway Bay Sports Centre is being supported by the Gold Coast City Council with a podium prize purse of A$3,500 on offer. Two qualification rounds will be held on Saturday, with the first two teams across the line and two next best times from each to go through to Sunday’s final. The remaining teams will contest a repechage on Sunday morning where an additional two teams go through to the A final and remaining teams contest the B final Sunday afternoon. Each athlete will complete a full super sprint triathlon of 300m swim, 8km cycle and 1600m run before tagging their teammate to begin the next leg. Australia’s London Olympian and Triathlon Australia Development Coach Brendan Sexton has been tasked with the responsibility of pulling together the event. He said, “All competition will be conducted within the Runaway Bay Sports Super Centre including the swim in the 50m pool, the cycle on the Criterium course and run on the athletics track, which will be an ideal venue.